Pin nailers are a neat tool to have. They fire 23-gauge pins, which are nails that are as thin as a sewing needle. 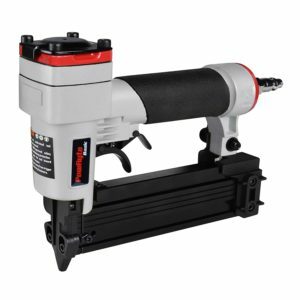 The ideal use for this type of nailer is for projects where it is important to make a small impact with strong holding power. Pin nail guns are often used for installing molding on furniture so that it holds without leaving big ugly holes behind that need to be filled. You can use them to bond light and delicate materials together – this much is obvious. But you can also use pin nailers for when you need to glue and clamp larger pieces of wood together in a precise manner. You can avoid the side-to-side motion of the glue-covered wood by securing it with a pin nailer. One could be mistaken for assuming then that pinners are interchangeable with finish and brad nailers. This is not the case, however. Brad nailers are used for nailing in thin carpentry materials, such as trim. And finish nailers are designed to be a versatile tool that can be used for lightweight carpentry, thin materials, and performing other carpentry tasks that require a thicker (16 gauge) nail. Pin nailers are good for fastening materials without leaving behind much evidence. They are made to be able to deal with awkward shapes and get into tight spaces with ease. One important thing to remember about pin nailers often called pinners is that the pins they fire do not have nail heads, which means that you will need to be careful when you place them, as removing the pins will be a challenge. Pinners, unlike other forms of nailers, don’t have a select fire style that enables bump-firing. Instead, they typically use a dual-trigger mechanism that requires you to pull two different triggers to fire a pin. The reason for this is because, first of all, pin nailers are more compact and lack the safety mechanism that prevents bump fire mode from creating accidents. Instead, the dual-trigger design replaces that system. The dual triggers also allow you to precisely place the pins exactly the way you want to – since removing pins is extremely difficult and bump fire mode creates the potential for sloppiness and mistakes. Quality design is the first thing you want to look for. 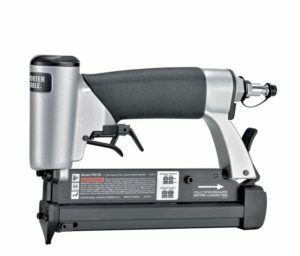 How reliable is the nailer? Will it last you a long time? Is it lightweight enough to be easy to handle, but durable enough to survive all the things you need to put it through? Is the nailer small enough to be used in tight places? How is the balance, and the grip? A good design makes or breaks the nailer. It’s the most essential quality. If the grip is uncomfortable or slips when you’re sweaty, you might drop it. If the nail gun is top-heavy and bulky, it will be awkward to use. Whether you are a pro or a newbie, it’s good to have a user-friendly tool. If changing the settings is needlessly complicated or requires extra tools, you have to ask yourself whether you want to go through those extra steps when other nailers can do the same thing but much easier. Speaking of user-friendliness, with pneumatic nailers, it’s good to have a 360-degree hose fixture, so that you can angle the hose to your air compressor as needed. Without this feature, you will find yourself fighting with the hose, and it will feel restrictive. You’ll want to pay attention to the other goodies that come with the nailer – does it come with safety goggles or a protector case? Those are things you will want, especially goggles. Eye safety is of paramount importance. Belt hooks are good for keeping the nailer close to you. Keep your eye out for nailers that have this and other convenient extras. Lastly, you should pay attention to what the nailer is capable of holding. Can it fire 2-inch pins? If you need to use them and your pinner can’t fire them, that would be just plain silly. Know your needs, and look for the pin nailer that meets them. 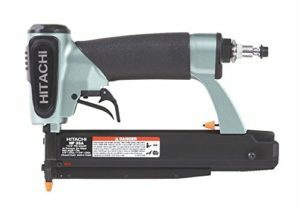 Hitachi products always end up scoring high on top x tools lists, because frankly, Hitachi just makes good stuff. The reliability of all of their products is well known, and this pinner tool is no exception. This is a great, inexpensive option for if you need a pinner tool. It’s long-lasting and durable, so you don’t have to treat it like a glass cannon. It won’t fall apart if you use it as intended. It’ll just keep on trucking. Remember what we said about picking a nailer that is easy to use and understand, even if you’re a pro and you know everything there is to know about these tools? Well, this pinner’s magazine can automatically adjust to fit pins from 5/8” to 1-3/8” in length. Hitachi NP35A has a simple depth adjustment function so you can control how you drive the pins into the wood perfectly. And it comes with a reload indicator that helps you know when you’re running out of nails, so you don’t start dry firing. And not only that, this pinner also has a large magazine capacity to ensure that you don’t have to stop and reload all the time. If it does jam, you can remove the nose plate and clear it in seconds and get back to work, which is a feature we love in all nailers, not just pinners. There is a housing shield on the front to protect the work surface from scratches. This is something that makes a huge difference with pinners because they are designed to leave almost no trace. The rear exhaust directs debris away from the work area, keeping things nice and clean. This unit comes with a protector case and a pair of simple safety goggles, which you absolutely should wear unless you already own a better set. We cannot stress eye safety enough. Bostitch is another of our go-to brand names. They make excellent nailers, no question about it. This nailer in particular features aluminium housing that is light and easy to handle, while also being durable and tough. The grip is fantastic. The HP118K doesn’t slip at all in your hands, even on hot days. The grip combined with the standard double triggers makes it a safe and easy nailer to have at your side when you have a project that demands a pinner – and you quite literally can keep it at your side with the belt hook it comes with. There’s a simple depth-of-drive switch, allowing you to switch between high and low power. The upside to this is that it’s extremely user-friendly and easy to comprehend. Even a child could figure it out. The downside is that you lose a degree of control over the depth-of-drive. There is an easy way to tell whether or not a power tool is built to be able to survive all the wear and tear that nail guns go through and more: check on what the warranty is. Companies hate to fulfill warranty obligations, so they’re only going to offer a warranty if they are confident that 99.9% of customers won’t need it. The warranty on this nail gun is for 7 years. Which means that Bostitch has made this pinner good enough to last through frequent usage for at least that long. That is textbook reliability for a nailer. We’re a big fan of the low profile nose that helps with accuracy and precision. We also like the rear exhaust that keeps all the debris away from the work area. Bostitch HP118K has a great psi range. It operates at 70-120 psi. It comes with a standard 1/4 inch thread fitting for your air compressor hose. If you plan to go through a lot of pins, then you’ll be very happy with the 200 pin magazine. The large capacity is great for keeping the nailer going for as long as you need it to while keeping the reloads to a minimum. And the best part is, it’s so easy to load. You just slide out one of the moving mechanisms in the magazine, fill it with nails, and push it back into place until it’s properly secured. That’s all. This is a compact pinner. Combined with the low-profile nose we mentioned earlier, this thing can easily get into tight corners and work with oddly shaped materials. 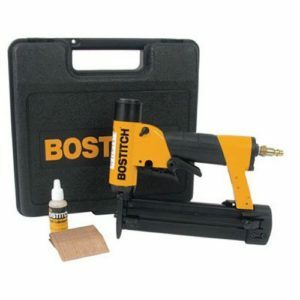 This is a good pin nailer to get for people who do a lot of custom carpentry. It comes with a handy carrying case, and 1500 pins, as well as some lube for maintenance and care. Remember, even if it is built to last over 7 years, you still need to take good care of it and maintain it well. This aesthetically pleasing pinner tool comes to us from grex. The green, compact design can maneuver through the tightest areas with ease. It’s slim and weighs 3 pounds, making it easy to use and work with. This nailer has a bit of a special feature – it has a built-in silencer! Anyone who’s used nailers can tell you that they can get pretty loud. It’s an unfortunate by-product of the mechanisms. While the Grex P650 is by no means quiet, it generates far less noise pollution than the other nailers out there. The psi range is fairly low, which makes this nailer pretty good for working with more delicate materials, like very thin pieces of wood or even PCV. This is a versatile pinner. It can accommodate a wider range of nails than most others, from 3/8th of an inch to 2-inch pins. The reason for this is the adjustable magazine that automatically and efficiently adjusts itself to suit whatever nails are loaded inside. The rear exhaust blows all the bad stuff away from where you’re driving nails into, and the powerful motor means you can penetrate even harder materials with ease. It features a fancy integrated hex wrench storage compartment in case you need one for adjustments. The Grex P650 comes with a simple carrying case. This is a great nailer for assembling things like picture frames and mirrors due to its slim, compact design and its versatility. Please note: if you live in California, this nailer comes with a proposition 65 warning – Californian residents are entitled to special warnings regarding products that contain chemicals that could cause cancer or reproductive harm, including potential birth defects. For power tools, this often comes up in reference to the stuff that comes out of the exhaust. It is better to be safe than sorry, so wear a face mask to prevent you from breathing in anything potentially damaging, and if you’re pregnant maybe wait up to 9 months before you pick up the power tools. We cannot stress enough the convenience of owning a user-friendly nailer. It just makes life so much better. You can fiddle with tools and go through elaborate means of controlling every minute detail, but why would you want to when you can achieve the same quality work with ease? If there’s an easier way that gives you the same excellent results, why wouldn’t you use it? That’s where the user-friendly Porter-Cable PIN100 comes in. The magazine adjusts for different nail lengths automatically. It holds 170 nails and it’s a bottom-loaded magazine that’s easy to reload. There’s a low nail indicator that tells you when it’s time to reload so you don’t dry fire the device. There’s a fantastic rubber grip that doesn’t get slippery even when you’ve been sweating for 8 hours in the Arizona heat working on a project. The tool itself is lightweight and is perfectly balanced to allow you to maneuver it any way you need to. It has that standard dual-trigger system to keep you from accidentally putting a nail through your finger. This is a simple, easy to understand and use nailer that is great for when you need to do molding and other finishing projects. The biggest con here is that there isn’t much variety in the length of nail you can work with, but if you’re working between 1/2 inch and 1-inch pins, then that little hiccup doesn’t even matter to you. As we said before, you pick the nailer that suits the job, not the job that suits the nailer. When I think of this nailer, the first word that comes to mind is “economical”. This isn’t the nailer you would get if you’re a professional who would use it every day of the work-week. This is the nailer you’d get if you’re on a tight budget and you still want to get something dependable. This is the pinner that makes you say “it was surprisingly amazing”. For the price, you just don’t expect it to match up to pinners that cost $80-$300. And yet, in a lot of ways, it does. It’s one of the lightest nailers on this list, clocking in at an incredible 2.1 pounds. Because it is light, compact in design, and features a small, narrow nose, you can get it to fit in anywhere you’ll need a nailer. It’s lighter and handles better than some pro-quality pinners. Is there a tight fit you need to fire into? No problem. This tool can handle it. The psi range and the nail length range are both fairly typical – nothing fancy, but nothing bad either. The psi ranges from 70-110, and the nailer can handle 5/8″ to 2″ nails. If you get a jam – and you will, because all nail guns suffer from jams occasionally – you can just pop the nose plate right off and clear it away with no stress or troubles, and then get right back to driving in the pins. Because of how easy it is to use this nailer, and how good the handling and balance is, this one outclasses many of the $200 units when it comes to driving in nails above your head. When you have to reach into those high places, or at least hold the nailer above you, your arms won’t get tired so easily. The nose tip won’t scratch up your work area, as it’s made to avoid such annoyances. You can build whatever it is you plan to build without leaving any ugly marks behind. PowRyte 18 gauge nailer comes with Allen wrenches and oil for maintenance, so you can get your money’s worth and more out of the tool. This nail gun also comes with a proposition 65 warning for the Californians out there – and for everyone else, for that matter. Maintaining your health and safety is the most important project after all. Pin nailers are surprisingly versatile – there are a great many things you can do with them that you can’t do with other nailers. Whether you want to reduce the amount of visual evidence of the nails or you need to hold some materials together before you can clamp them down, this tool can help you out. The headless 23-gauge nails are a fantastic thing to have in your carpentry arsenal. Pinners differ dramatically from other types of nailers, which is why they confuse even seasoned tool enthusiasts and users. Instead of a select fire system, you have the safe dual-trigger system. The magazines hold way more nails than other nail guns. The pin nailer is far more compact and small in stature. 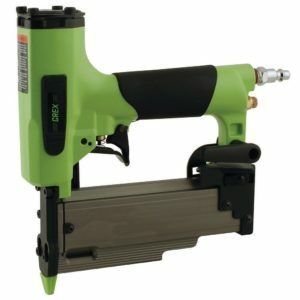 The weight is also extremely low compared to other types of nailers. When you look for a pin nailer, you want to find something that is easy to use but also efficient. You want a good magazine capacity and a nailer that can do automatic adjustments. You want a simple method of adjusting the depth of drive and you want a nailer that is easy to use and control. A pinner is generally not the first nailer you buy, so if you’re here now, chances are that you know a thing or two about nailers already. As always, just pay attention to what you are buying and make a decision that fits your needs.